This page describes how to use Key Visualizer to check for performance issues that are related to your Cloud Bigtable usage patterns. If you haven't used Key Visualizer before, it's a good idea to complete this check at least once. Before you read this page, you should be familiar with the overview of Key Visualizer. During the previous 24 hours, the table contained at least 30 GB of data at some point in time. During the previous 24 hours, the average of all reads or all writes was at least 10,000 rows per second. Go to the Key Visualizer page in the Stackdriver Monitoring console. To view a list of available scans, click Hourly Scans or Daily Scans. If your Cloud Bigtable instance has more than one cluster, you will see separate scans for each cluster. Find the table you want to analyze, then click the time of the scan you want to analyze. The console displays the scan. As you review the scan, keep in mind that Key Visualizer heatmaps group metrics into key buckets, or contiguous ranges of rows, rather than showing metrics for each individual row. See Key buckets for details. If you want to compare metrics or look for data correlations, you can display several Key Visualizer metrics together at the same time for the scan you've chosen. See Finding connections between different metrics for instructions. The following sections explain how to complete an initial check for performance issues. As a first step, review the heatmap for the Ops metric, which measures the number of operations per row per minute. This metric is roughly equal to the combined number of reads and writes. Key Visualizer shows this metric by default when you open a heatmap. Ranges shown in dark colors have little or no activity. Ranges in bright colors have significantly more activity. The glowing white range in the middle has very high activity. In the example, some of these patterns repeat every 24 hours, possibly because a large batch job runs every day at the same time. As you look at the heatmap for the Ops metric, keep in mind that brightly colored areas do not necessarily indicate poor performance. In many cases, Cloud Bigtable can perform well even if reads and writes are not perfectly balanced across a table. The presence of Warnings metrics usually indicates that there is a performance issue. For Warnings metrics, Key Visualizer provides details about the row keys or key ranges that caused the metric to appear. Learn more about the Warnings metrics. If any of the Warnings metrics include high values, a diagnostic message appears above the heatmap to identify the issue. Learn more about diagnostic messages. If one of these list items is disabled, there are no warnings in that category. Otherwise, you should view the metric and drill down into the issue that it identifies. See Exploring Heatmaps for details. If the heatmap shows only low values for a Warnings metric, or if there are high values that occur for less than 30 minutes, it's likely that you do not need to take any action. If you see high values for long periods of time, it's a good idea to investigate further. Use filters to reduce the amount of data that you read. Change your schema design or your application so that the data in a heavily used row, or in an excessively large row, is spread across multiple rows. Update your application to cache the results of reads from Cloud Bigtable. Update your application to batch and deduplicate writes to Cloud Bigtable. If the Large rows metric is present for a key bucket, examine the rows in the highlighted key bucket, then change your schema design or your application so that less data is stored in those rows. If you complete the initial check for performance issues, and you don't see any major warnings or unexpected access patterns, you can close Key Visualizer and move on. Otherwise, continue your investigation by looking at other metrics and focusing more closely on key ranges that might be causing problems. Learn more. Learn to recognize common patterns in heatmaps. 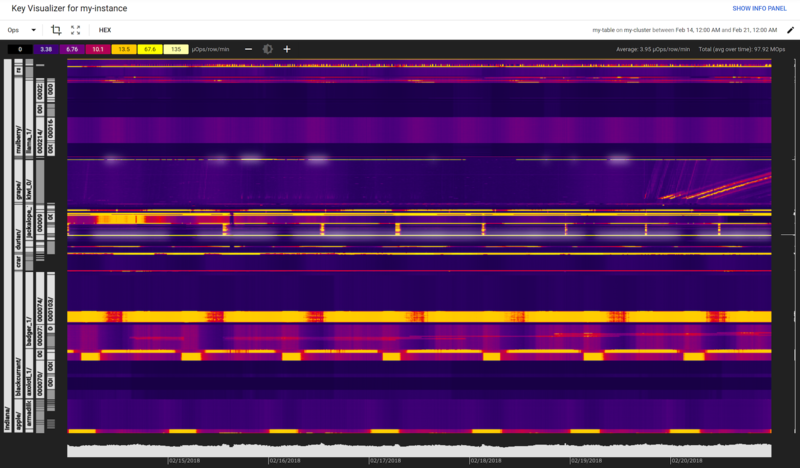 Find out how to explore a heatmap in depth. Read about the metrics you can view in a heatmap. Understand the diagnostic messages that Key Visualizer can display.